Hope you enjoyed your week of patriotism, because as of tomorrow it’s officially over. After a week of star-spangled anthems and explosive tributes to the good ol’ USA, your Trailguides – or at least the three that are coming to work – will turn over the studio turntable to foreign influence. 1970s, influence, to be more precise. • Craig will kick off the day with an obscure compilation of non-single tracks from British rock group, The Move. Released in 1974 on the Music for Pleasure Limited label, the self-titled compilation features eight tracks from the band’s first three studio release: Five from their initial self-titled debut from 1968, one from the early 1970 release, Shazam, and two from their late 1970 release, Looking On. The Move was a conglomerate of musicians from several established Birmingham-area bands; you would probably recognize the trio that comprised its final line-up, as their next project became known as Electric Lights Orchestra. • Alanya is out this week, so Robert will follow-up with some Canadian country-folk rock from the “Godfather of Grunge” himself, Neil Young. However it’s the rocking Dixieland dis track “Southern Man” which has stood the test of time, and is likely the most recognizable from this collection. 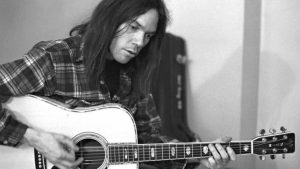 Don’t miss your chance to enjoy a bit of live Young performance next week as the Trail 103.3 hosts a special screening of 2005 documentary “Neil Young: Heart of Gold” at the Roxy Theater as part of our monthly “Trail Movie Night” feature. • And just when you thought we were moving closer to home, Tommy sends us back across the pond to the solo debut of Paul McCartney. McCartney, released in 1970, was recorded during a period of depression after former songwriting partner John Lennon announced he would “divorce” the Beatles just a few months prior. 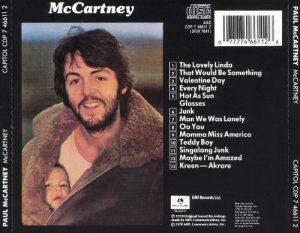 McCartney recorded the album entirely by himself, with the exception of a few contributions from his wife, Linda; it’s most recognizable single is “Maybe I’m Amazed,” which helped push it to No. 1 on the US charts for three straight weeks. The rock legend will celebrate the release of his 17th solo album, Egypt Station, in September.